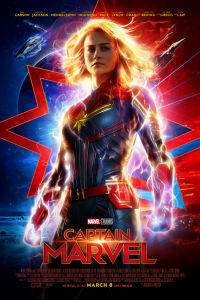 Marvel studios launched the second trailer for CAPTAIN MARVEL, directed by Anna Boden and Ryan Fleck. It’s a heavy-hitter worthy of Captain Carol Danvers herself, packed with aliens and mystery and Samuel L. Jackson digitally de-aged in a return to his ’90s cool. Let’s dive into all the energy of the new trailer. That’s cut against the old lady fight on the subway. So Carol Danvers, one of the MCU’s most powerful beings, punches this old lady in the face. And the lady reacts by getting angry and attacking the Captain with impressively acrobatic martial arts. It’s a safe bet that she’s a Skrull, probably on Earth working with Ben Mendelsohn’s Skrull operative, Talos. While the Skrulls are openly antagonistic, the Kree may not be the shining knights Carol Danvers thinks they are. Yes, the Kree definitely rescued Air Force pilot Carol Danvers when her jet somehow crashed on one of their worlds. They gave her the blood transfusion that saved her life and empowered her. They’ve apparently celebrated her ascension to become a heroic champion, and member of their Starforce. 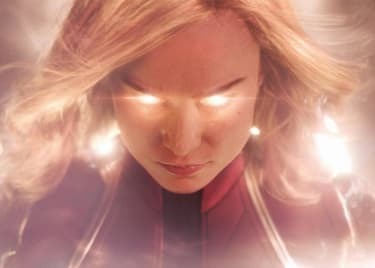 But, whether through amnesia induced in the crash or something more sinister, Captain Marvel has lost the life she had on Earth as Carol Danvers. She begins to rediscover that history upon returning to Earth. Those discoveries in turn lead to her to start asking questions. Those questions may bring her into conflict with her Starforce comrades and mentor Mar-Vell (Jude Law). 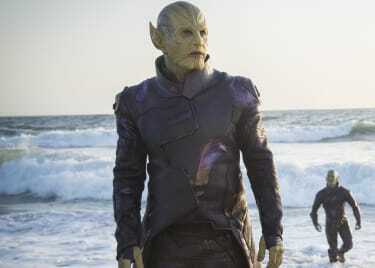 The Kree and Skrulls have been at war for years, and Carol vows not to fight that war, but to end it. Just as the character’s arrival on Earth leads her to investigate her past, the film CAPTAIN MARVEL takes audiences back 24 years to 1995. Samuel L. Jackson’s Nick Fury is a less cynical man, and looks much as he did in the 90s via digital de-aging. Danvers’ civilian costume includes a Nine Inch Nails shirt, a regular sight in ’95, following the gargantuan success of their second album The Downward Spiral in 1994. Even SHIELD’s super science has made the leap back – the jet Captain Marvel and Fury fly looks and moves like an earlier incarnation of the Avengers’ sleek Quinjet. While the fashion and Earth-tech of CAPTAIN MARVEL are deliberately retro, the Captain’s own look and fighting style are decidedly more modern. Her costume is a near-perfect translation of the one designed by artist Jamie McKelvie for the comics written by Kelly Sue DeConnick. Those began in 2012, and marked Captain Marvel’s elevation to the ranks of Marvel’s highest profile heroes. The high-flying, spaceship-blasting fighting style seen in the trailer was also seen in those comics. 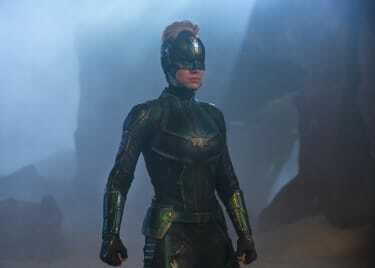 Carol’s moves here are the same ones that lead to one character in DeConnick’s run dubbing the hero “Princess Sparklefists.” Between Carol Danvers’ hunt for her own history, the machinations of two space empires and the full, glorious power of Princess Sparklefists, CAPTAIN MARVEL looks like a blast.